Def Leppard started their Rock Of Ages Tour 2012 last night in Salt Lake City with Poison and Lita Ford and included some rarities in an 18 song setlist. The tour kicked off in fine style at the USANA Amphitheatre in West Valley City near Salt Lake City. The band played 18 main songs including a 7 minute acoustic medley of some rarely played songs. The medley section was led by Joe who was then joined by the rest of the band to play brief versions of 'Where Does Love Go When It Dies', 'Now', 'When Love & Hate Collide' and 'Have You Ever Needed Someone So Bad'. Following this the band went into the soundcheck version of 'Two Steps Behind' (into solo after 1st chorus) - played much like it was at the Perth Telethon in 2011. The first time in concert with Rick since 1996. Other song changes from the 2011 show in the same city were 'Let It Go', 'Gods Of War', 'Women' and 'It's All About Believin' which made it's full concert debut following it's first play in New York last week for Fox And Friends. The band unveiled a new silver coloured stage show for the tour which included a new Union Jack shaped lighting rig. 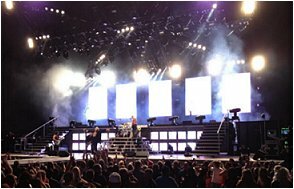 Five vertical video screens were used behind Rick's drum kit and two new sets of 12 square videos screens were set either side of him. The ramp section also remained with stairs at either end similar to the YEAH! tour staging. A Live Blog direct from the show happened on this site (although I don't recall a thing about it now...) thanks to US Lep fan Brett who gave live updates and sent many pics. Over 30 photos can be viewed in the Live Blog section via the show page link. The tour now moves on to Irvine, California tomorrow night. Percentage chance of another Live Blog? - "zero". Visit the show page for full shows details/links.